I find it ironic that people least explore their "own backyards:" New Yorkers who haven't been to the Statue of Liberty, Bostonians who've never made it to the MFA: that kind of thing. This goes doubly for college students (and their visiting parents) who, unless involved with the arts, rarely step into worthwhile museums right on campus. Yet some of these museums are World Class, sharing equal status with much larger and well-known institutions. 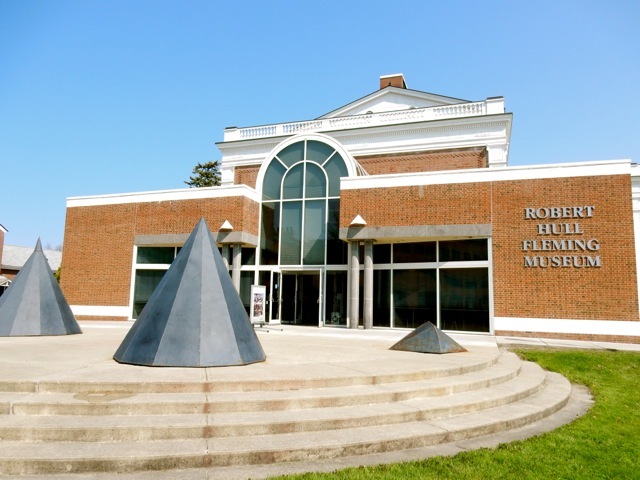 One, the Colby College Museum of Art, claims the largest art collection in the State of Maine. Another, the Harvard Museum of Natural History, houses a collection of 1800's glass flora so perfectly rendered, they were considered one of the Victorian Wonders of the World. 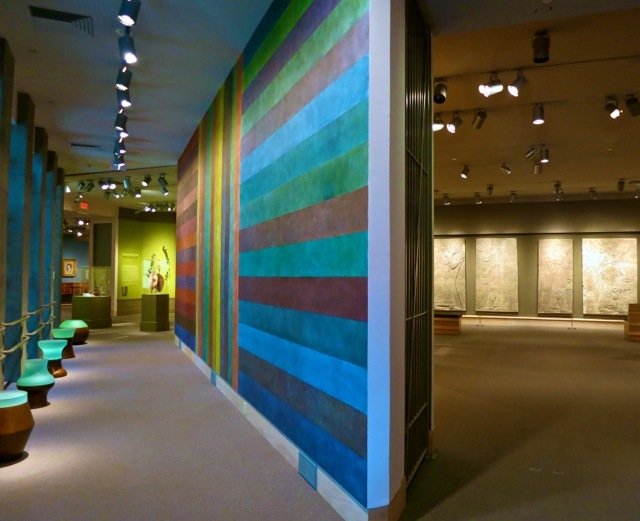 You'll find 3,000 year old Assyrian Reliefs, millions of Yiddish books and artifacts, Eric Carle's compositions writ large, architecturally significant buildings, and more on the following list of The Best College Art and History Museums in the Northeast. So, while on the College Tour, or the next time you're visiting your kids - or even if you don't have kids - linger on campus awhile for a (mostly) free cultural immersion. For more on what to do, where to eat and where to stay in each of these college cities or towns, check out GetawayMavens.com. Colby College Museum of Art, Waterville ME. 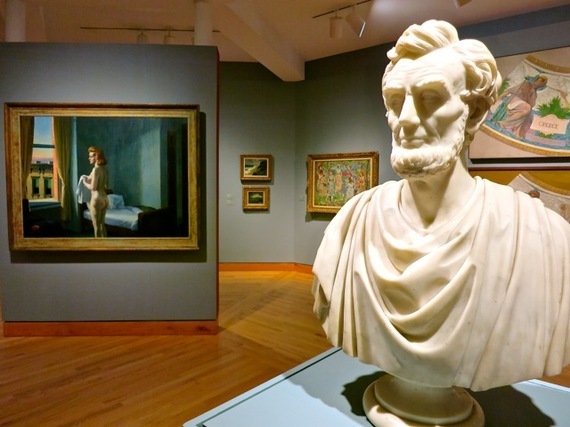 The Portland Art Museum cannot lay claim to the largest art collection in the State of Maine. 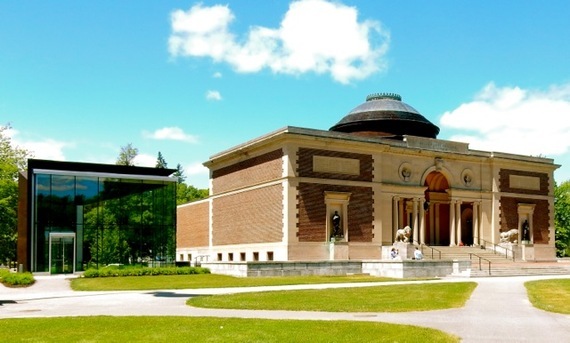 That would be this five-wing museum on the Colby College Campus - the darling of contemporary artist, Alex Katz, who has donated over 700 of his pieces to this institution. (Katz attended the prestigious Skowhagen Art School, about 20 minutes from here). The latest expansion, a stunning glass rectangular building designed by architect Frederick Fisher, added an airy 10,000 sq ft. to an already large space in which you'll find Singer Sergeant, Winslow Homer, Copley, Renoir, Remington, Rockwell, Calder, and a 1790 John Rogers portrait of George Washington, and much more in its many galleries. The Colby Art Museum has enough clout to mount a Whistler Exhibit (though most identified with France and England, Whistler was actually born and raised in New England), which includes a precursor to the famous portrait of his Mom that hangs in the Louvre. Open Tues - Sat 10-5, Sun 12-5, free. Bowdoin College Museum of Art, Brunswick ME. Enter through a glass cube into a wonderfully eclectic museum filled with everything from Assyrian cuneiforms to avant-garde video installations. This is a vibrant place, endowed in 1794 by James Bowdoin III whose 1811 bequest established the earliest collegiate collection of European paintings, drawing and prints in America. The murals, in the soaring, Walker Art Building's rotunda, are "designed to inspire," as Bowdoin considered "art a high point of Western Civilization." 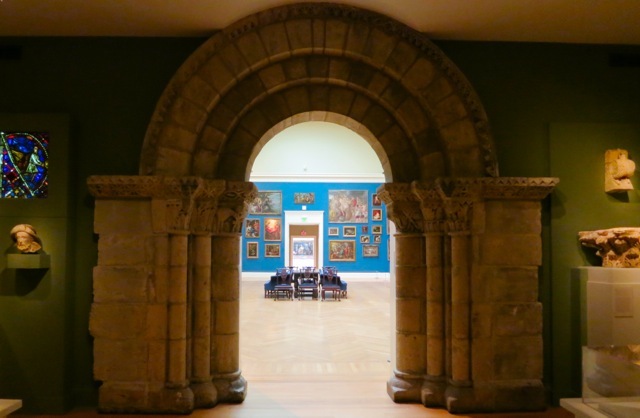 Bowdoin Museum of Art certainly is a high point among college museums, and very much worth visiting. While on campus, visit also the Peary-MacMillan Arctic Museum. Most visitors come to Bowdoin for the Art Museum, never realizing that this is here. But as eclectic museums go, this one is tops - celebrating the indomitable spirit of world exploration at the dawn of the 20th century, specifically Arctic expeditions conducted by Robert Peary (class of 1877) and Donald MacMillan (class of 1898) who together in 1908 were the first humans to reach the North Pole and record it. Exhibits are full of fascinating trivia, including remnants from a box of Grape Nuts Cereal that MacMillan loved, and items from the Crocker Land Expedition - a failed attempt to find a new arctic landmass, which was proven to be merely an optical illusion. Hudson Museum at U of Maine, Orono. You'll find this small but worthwhile museum inside the Collins Performing Arts Center (upstairs) on the U of M campus about 20 minutes north of Bangor. 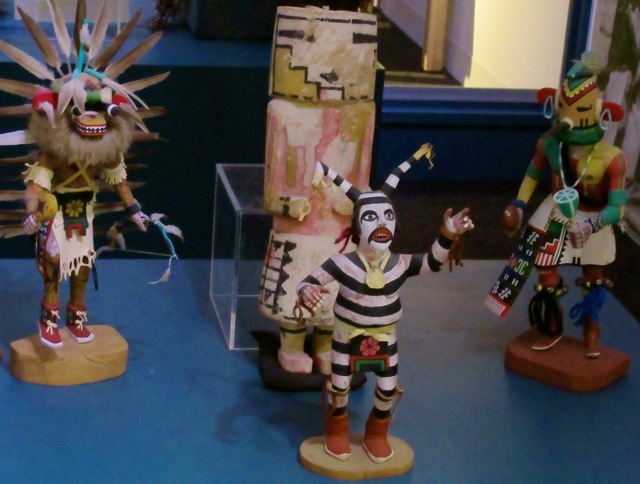 With a focus on pre-Columbian to contemporary, indigenous artifacts both delicate and freaky reside in glass cases that wrap around two rooms. See clothing and adornments, intricately woven baskets and clay jars, a Tsimshian Sun Mask, amazing Quillwork, Root Clubs carved into ferocious walking sticks, crooked knives (for skinning animals and whittling wood), and a Beetlejuice-like take on a Northeastern Kachina. Open Mon-Fri 9-4, Sat 11-4, free. Solar System Planets to Scale, Houlton to University of Maine, Presque Isle on US Route 1. Though it ends at U of Maine Presque Isle, this incredible and to scale model of the Solar System begins at the Houlton Information Center (northern end of I-95) and runs 40 miles to the U. of Maine Campus in Presque Isle on US Route 1. Keep your eyes open for the eight planets, some tiny, that stand by the side of the road, built in 2000 by the people of Aroostook County in cooperation with the University. The actual objects are 93,000,000 times the size of each representation. Larger ones (Jupiter, Saturn), of course, are easy to spot, but the smaller ones not so much. Given all the hoopla a few years ago around a similar project in the Nevada desert on 7 miles of dry lakebed, this one deserves attention for sure. Bates College Olin Arts Center Museum of Art, Lewiston ME. It's small but worth popping into for 20 minutes, more if you want to study "Maine Roots Artists," and other contemporary and modern art in two large galleries. Mon-Sat 10-5, Wednesdays during academic year until 7pm, free. Fleming Museum on University of Vermont campus, Burlington VT. Larger inside than it looks from the outside, this accessible encyclopedic museum provides bite size exposure to the greats. Enter through a soaring Victorian Era space, with magnificent arched windows, and continue into the museum's original entrance - a Greek Revival white marble rotunda with glamorous double staircase to the galleries above. You'll find antiquities, Native American artifacts, European Art and the modern collection including Warhol, Rauschenberg, Jasper Johns, Robert Indiana's LOVE, and Lichtenstein among others. Middlebury College Art Museum, Middlebury VT. Even if you didn't go there, or don't have a child looking at or attending the school, you'll want to step into this exciting contemporary art museum. Most exhibits are temporary, but Marcel Duchamp's collection of optical illusion discs rotating on a turntable is a mesmerizing staple. Grab an "Art In Public Places" booklet, and take a stroll. You'll find one of Robert Indiana's LOVE sculptures near the pond right outside, and twenty other works of art around campus. It's like a treasure hunt. Free, Open Tues-Fri. 10-5, Sat and Sun. 12-5. Hood Museum of Art and Orozco Murals in the Baker Library, Dartmouth College, Hanover NH. People come from all over the world to see a spectacular set of six well-preserved 3,000-year-old Assyrian Reliefs brought to Dartmouth from Iraq in 1852. Inscriptions on these cuneiform tablets from the palace of Assyrian King Ashurnasirpal II (circa 883 BCE) correspond to Biblical stories, so they serve as important historical and religious documents and touchstones as well as works of art. But the Reliefs are not the only draw here. The Hood is also home to several story-telling Japanese Scrolls - the graphic novels of their day - a set of beautifully mounted African weaponry, and a Sol LeWitt designed wall (implemented by Dartmouth students) among 70,000 artifacts that rotate frequently with only 2% on view at any time. As a "teaching museum," the Hood hosts students from every discipline, including those in Medical School who come to perfect their "Medical" or "Clinical Gaze" by diagnosing the subjects of well-rendered portraits. Open Tues-Sat 10-5 (Wed open till 9pm), Sun 12-5, Free. Jose Clemente Orozco was, with Diago Rivera, a leader in the Mexican Muralist movement. As a Dartmouth Artist-in-Residence from 1932 to 1934 he painted "The Epic of American Civilization" in themes of human suffering and machine age angst, on all the walls in the basement of Baker Library. The result is dark and overwhelming and completely mesmerizing. Given National Historic Landmark status in 2013, more and more visitors come to Hanover just to see this incredible body of work. Open when the Baker Library is open, check hours here. Free. Update: The Hood Museum will be closed for renovations until 2019. In the meantime, the public can view some Hood exhibits on Main Street in Hanover at Hood Downtown, open open from 11 a.m. to 9 p.m. Wednesday through Saturday, and on Sundays from 1 to 5 p.m.
Eric Carle Museum, Hampshire College, Amherst MA. This homage to the man who brought A Very Hungry Caterpillar and Brown Bear Brown Bear to the world is as fresh and vibrant as his books. 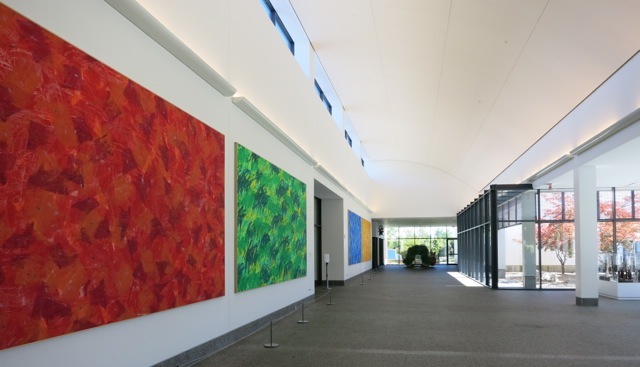 The clean-lined rectangular contemporary stone and glass structure encompasses a vast sunlit hall with several huge multihued abstract oils, three galleries (one always devoted to Carle's work, the other two displaying a rotating roster of illustrious children's book illustrators) and the Art Studio. Kids like the galleries, but the real draw for them is the well-stocked Studio - free with admission - where they can draw, cut and assemble their own pictures and work on art projects with help from Art Teacher docents. 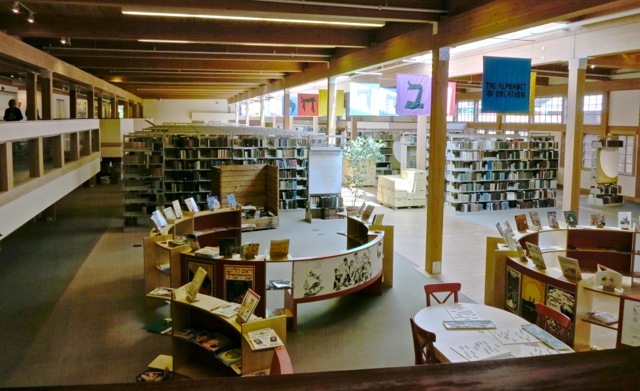 Yiddish Book Center, Hampshire College, Amherst MA. Travel writing is my schtick. I am a Getaway Maven after all. So, with what some would call chutzpa, I schlepped on up to Amherst MA to schmooze with the mensches at the Yiddish Book Center. Even if you are not Jewish, you'll possibly know some of the italicized words in this section, proving that Yiddish is far from a dead language. But in 1980, when Hampshire College grad Aaron Lansky was getting his Masters in Yiddish Literature at McGill University, he was hard pressed to find any books in that language. This led to a request for books posted as handwritten notes in those New York coffee shops that Lansky knew to be frequented by old Jews. The response, you'll learn on an eye-opening visit here, was overwhelming. Over 1.5 million books - representing 40,000-70,000 titles - have been collected so far from vanishing Jewish communities around the world, including Zimbabwe and China. Along with stacks of books (with more both coming and going - the YBC has established over 600 Yiddish Libraries all over the globe), you'll find interactive exhibits, movie film clips, artifacts, video interviews, and a cornucopia of programming. Williams College Museum of Art, Williamstown MA. On the Williams College campus, this is the little museum in between the 'big uns (Clark and Mass MoCA), but with approachable appeal. Though its collection spans the history of art, the focus is on work from 18th century to present. As a "teaching" museum, permanent galleries sport a whimsical juxtaposition of objects, and temporary shows are both important and popular. "The WCAC is a great stop between The Clark and Mass MoCA," says a local, "with both older and avant-garde contemporary pieces." Open 10-5 Thur-Tues (closed Wed), free. Harvard University Museums, Cambridge MA. Harvard maintains 9 museums, but one of the best is the Harvard Museum of Natural History, opened in 1874, which still features an exhibit once considered a Wonder of the World. 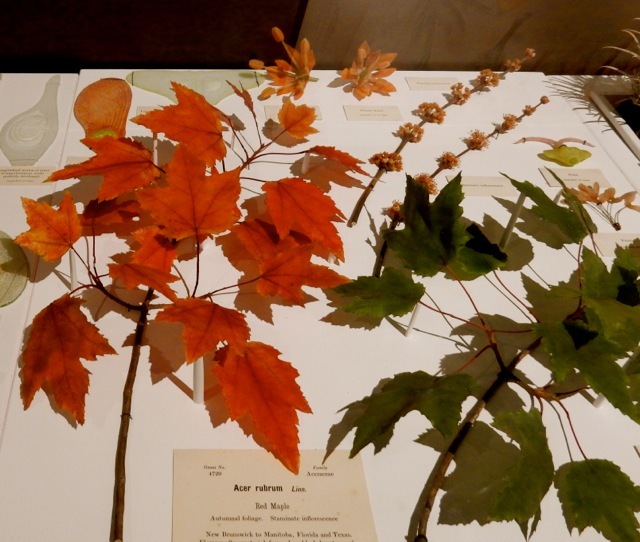 In the late 1800s, German glassmaker Leopold Blashka (and later his son) created incredibly lifelike flora and fauna for the then-named Harvard Botanical Museum (now the Harvard University Herbaria). Used by professors to teach Botany, a shipment of these models was held up in customs as authorities were convinced that they were live plant matter. Preserved in hip-level glass cases, these fragile works of art are indistinguishable from the real things and are truly breathtaking. But that's not all this marvelous museum, which would be endorsed heartily by Indiana Jones if he were a real person, has on offer. There's an actual Dodo Bird skeleton, real Hissing Cockroaches, 300 mounted Hummingbirds of every kind, boards of pinned insects that wouldn't look out of place in an art museum, a 4.5 billion year old meteorite you can touch, an incredibly diverse rock and minerals display, and thousands of other natural specimens. After an extensive upgrading, old school meets new school in galleries that include the multi-generational favorite, "frozen zoo" dioramas, along with videos, touch screen aps and other technological innovations to engage the most jaded adults. The brand new Marine Life in the Putnam Family Gallery will boggle your mind. Lighting effects create the illusion of movement even though there is no water. While the Museum of Natural History is all about the natural world, the Peabody Museum of Archeology and Ethnology concentrates on Human Culture from ancient times to modern. At any given time, only 3/10ths of 1% of the museums holdings is on display, which makes it exciting for the repeat visitor. Formerly separate entities, the Fogg, Arthur Sackler, and Busch-Reisinger Art Museums are currently all one. Linked by a dramatic interior courtyard, you'll see the best of Miro, Monet, Mondrian, Calder, Asian art, Religious Icons, and works from ancient to modern from all parts of the globe. It's the MFA writ small, and a joy to see. Davis Museum At Wellesley College, Wellesley MA. Built in 1993, architect Raphael Moneo envisioned this compact yet soaring museum as a jewelry box that opens at each landing to reveal its treasures. Steps are shallow and take concentration to climb, which turns the whole experience into a meditative exercise. A "Micro-Encyclopedic" museum (10,000 objects, ancient to modern, that rotate in and out), art is provocative, compelling and approachable. Tue-Sat 11 am - 5 pm Wed until 8 pm, Sun 12 pm - 4 pm, free. RISD Museum of Art, Providence RI. Though Rhode Island School of Design itself is known for forward-thinking design, its art museum looks as far back as antiquity. You'll find an Egyptian mummy lying by its sarcophagus, medieval cherub, landscape and religious oils, Greek urns all the way up to Matisse, Cézanne, Warhol, and Koons among 86,000 objects and artifacts. Open Tues - Sun 10am-5pm, $12 adults $3 kids. 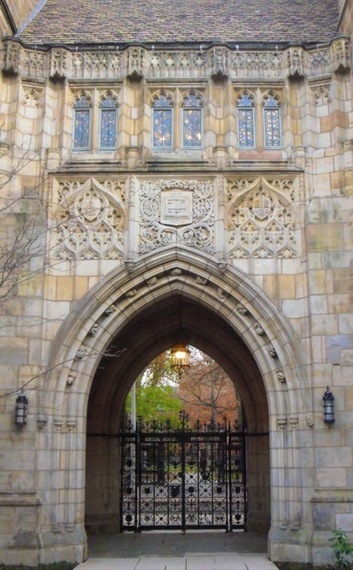 Yale University in New Haven CT can be considered one big museum, with architecturally significant libraries and Art Galleries that spread out onto New Haven's main streets. The Beinecke Rare Book and Manuscript Library has one of the few remaining Gutenberg Bibles left intact in the world. In place of typical glass windows that can damage rare books, the library's interior is illuminated by natural light diffused through 1 1/4 inch thick translucent panes of ochre marble. In the afternoon, when the sun is low in the sky, the inner shaft of books appear ablaze - a spectacular time of day to visit.Yale University Art Gallery, designed by "Starchitect" Louis Kahn as his first commission, has recently undergone a $135 million renovation uniting three historic buildings. Reopened in December 2012, the expanded museum now runs 1 ½ city blocks with nearly 70,000 square feet of exhibit space. With a 4,000-piece collection of European, African, Asian and American art from ancient to contemporary, this museum does not overwhelm. It inspires. Yale Center for British Art, housed in Louis Kahn's final design, is the first museum in the US to incorporate retail space on the street. A wood-paneled four-story interior housing the largest collection of British art outside of the UK covers an enormous amount of territory from the Middle Ages to modern times. Perfect for those fascinated by early portraiture, maritime oils and lots of equestrian paintings. Lyme Academy College of Fine Arts, Old Lyme CT. Roughly 200 students from all over the world attend the accredited Lyme Academy, originally founded in 1976 in the basement of the Lyme Art Association building. Stop in to see ever-changing exhibits from the next generation of fine artists. Coast Guard Academy and Museum, New London CT. The history of the Coast Guard is well documented in this 3,500 sq. foot museum on the campus of the US Coast Guard Academy. Go to learn a bit of history, take a campus tour and/or to enjoy the view of the Thames River. Offbeat trivia; the Tall Ship barque Eagle was built in Germany in 1936 and originally used to train Nazi naval cadets. It was confiscated by the US after WWII, and has been used ever since to train US Coast Guard cadets. Plans are in the works to build a World Class Coast Guard Museum in New London, which will enable historians and curators to display and depict the history of this crucial branch of the US Military. Stay tuned. Museum open Mon-Fri 9-4, Sat. 10-4, Sun. 1-4 during school year. See website for summer hours. 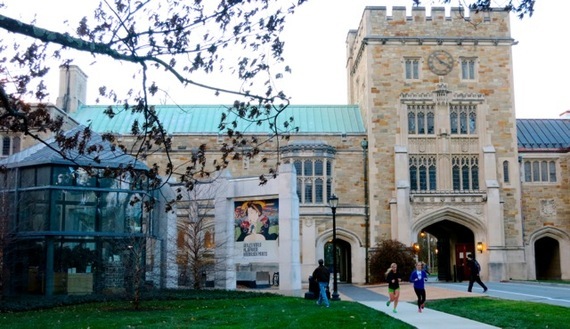 Frances Lehman Loeb Art Center/Vassar College, Poughkeepsie, NY. Head through Vassar's main arched gate, and look right to find the contemporary glass entrance of the Frances Lehman Loeb Art Center. Small galleries hold nuggets from ancient to modern; Thai, Chinese, Tibetan, 1st Century Roman, Greek. You'll find the head of an Egyptian viceroy from a sarcophagus cover along with famous Dutch painters, a Bellini triptych from 1440, Christ, Madonna. Picasso, Matisse, O'Keefe, Munch, Bacon, Ernst, Moore, Calder, Lichtenstein, Stella. Come to visit your favorite piece. Students often do. Samuel Dorsky Museum of Art at State University of New York New Paltz, NY. A lot of an artist's fame has to do with timing - mostly by being on the edge of a movement. But there are many others who should be lauded, and that's where the Dorsky comes in - by focusing on lesser-known artists or those who have fallen out of favor. 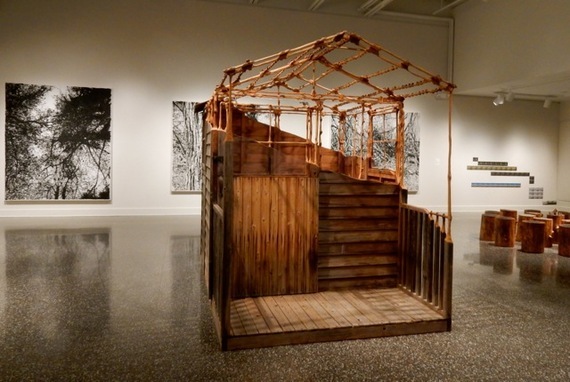 Second in size only to the Neuberger Museum at SUNY Purchase (within the SUNY system), the Dorsky is 9,000 sq. ft. of relatively new space (it was formerly the College Art Gallery). 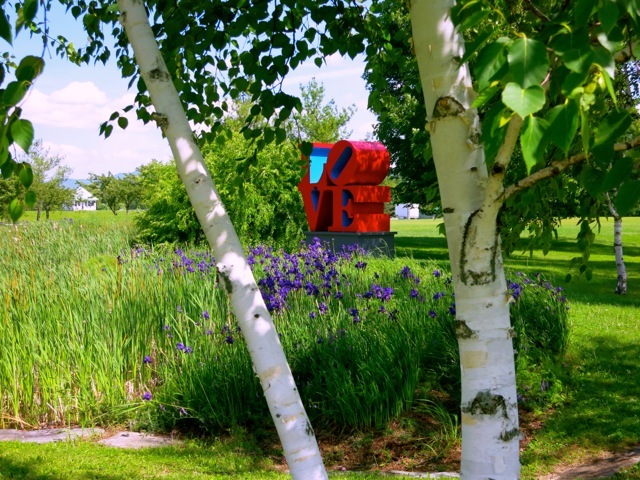 With a mission to serve both the college campus and the artistic culture of the Hudson River Valley - the "Cradle of American Art" - the Dorsky is unlike any other regional museum. Divided into two parts, the 6,000 sq ft. main gallery highlights rotating items from the permanent collection, including a large number of photographs from Howard Greenberg. One of the foremost photography dealers in the world, Greenberg was an early Dorsky supporter who founded the Center for Photography in Woodstock NY. A separate 3,000 sq ft space is devoted to innovative Hudson Valley artist themed show. Open Wed-Sun 11-5, Suggested donation $5. 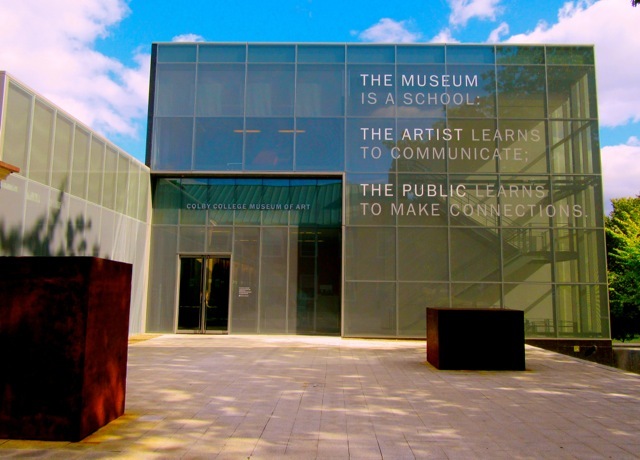 Neuberger Museum of Art, State University of NY (SUNY) Purchase, NY. Established in 1974 with 108 pieces from the collection of Roy Neuberger, this encyclopedic museum has grown to over 6000 paintings and sculptures with a concentration on modern, contemporary and African Art. You'll find Milton Avery to Max Weber, Thomas Cole to Willem DeKooning, Edward Hopper, Rothko, and generally unsung female artists, Georgia O'Keefe, Lee Krasner, and Joan Snyder. Princeton University Art Museum, Princeton NJ. Princeton's holdings represent one of the largest of any university art museum, yet it is superbly laid out and surprisingly intimate. Most small museums have one Monet, one Warhol. Princeton has three of each. Upstairs, you'll find provocative and important pieces of contemporary and European art: downstairs, Medieval and antiquity artifacts second to none. 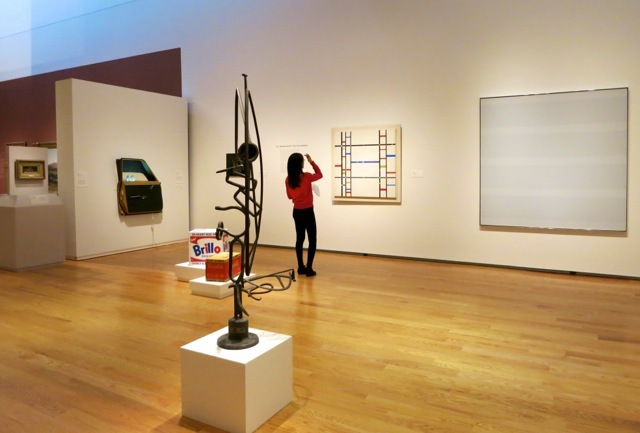 Though the Princeton University Museum covers five thousand years of art and culture, with a rotating collection of 93,000 items on two large floors, it is beautifully curated, with juxtapositions both experimental and provocative. 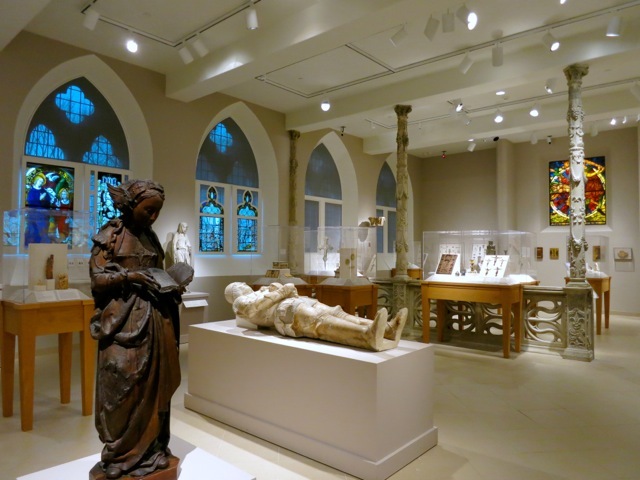 The Medieval Church Exhibit is arguably the museum's most captivating, especially during A Capella and Chamber Music Concerts, set amidst stained glass windows, Gothic mantelpieces, and sculptures from France, Spain and England. Amble through a display of Japanese "Wit and Humor," Roman mosaics, Grecian urns, Chinese porcelain, and Egyptian artifacts - brought back by students in the Princeton Department of Archeology, who have been digging up Cyprus for the past 35 years. Free, Tues, Wed, Fri. Sat. 10-5, Thurs 10-10, Sun 1-5. Cathedral of Learning Nationality Rooms, University of Pittsburgh, PA. For lovers of the offbeat, plan to see the University of Pittsburgh's "Cathedral of Learning" - home to twenty-nine "Nationality Rooms." Think of it as "Winterthur on Campus." The building - a 42-story cloud-piercing Gothic Revival edifice - is worth visiting in itself. The "Cathedral" made an appearance in the movies, The Mothman Prophesies, 42, and The Wonder Boys. But the functioning classrooms, designed in exacting detail to represent different cultures at various time periods across the world, are the real draw. There's an 18th Century Russian Peasant home, an Early 17th Century Scottish room, an 18th century Swedish cottage, a room from Ireland representing the mid 900's that contains a set of chairs with carved Irish Wolfhound armrests (to ward off evil spirits). There's a 1510 world globe in the Polish room - the first to depict North America as a separate continent - and an illuminated mosaic of Constantine in the church-like interior of the Romanian Room. Open during school hours when class is not in session. Free. 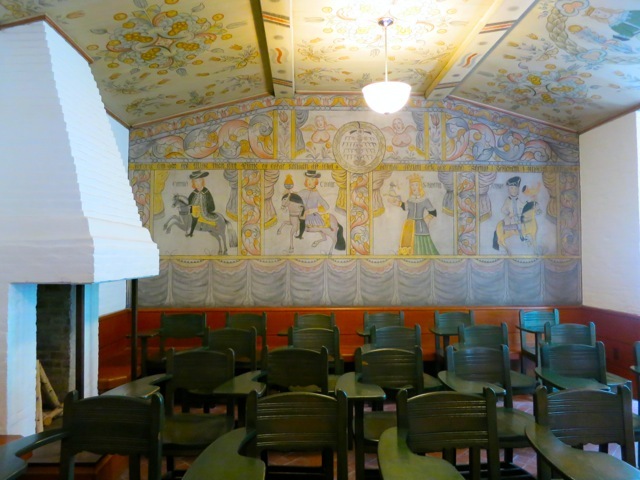 Pennsylvania German Cultural Heritage Center, Kutztown University PA. Pop quiz: how many readers think that the PA Dutch (another name for PA German) and Amish are interchangeable terms? If so, you might be surprised to find that though the Amish are PA Dutch, they and the Mennonites collectively represent only 5% of the PA Dutch community. You'll discover this and other myth-busters on this scholarly but highly entertaining tour of this folk-life center that preserves and promotes the PA Dutch culture and traditions. 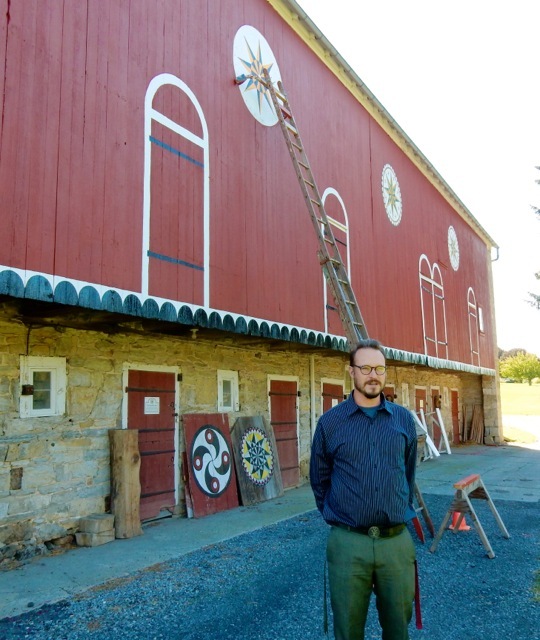 Tour a one-room schoolhouse, a typical German Bank Barn and a farmhouse - all on a section of the Kutztown University campus - conducted by a Pennsylvania Dutchman and historian, Patrick Donmoyer. Pennsylvania College of Art and Design, Lancaster PA. A leader in the installation of public art, has been a downtown anchor for thirty years, bringing in free speakers, international artists and signature events. At the very least, pop in to peruse the College Gallery exhibition.